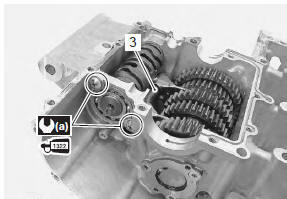 Install the transmission in the reverse order of removal. replace the removed bearings and oil seals with new ones. 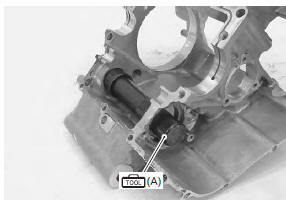 Install the driveshaft left bearing oil seal into the retainer using the special tool. Install the driveshaft left bearing with the special tool. the stamped mark side of the driveshaft left bearing faces outside. 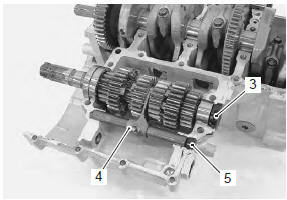 Install the gearshift shaft bearings (1) and (2) with the special tool. the stamped mark side of the gearshift shaft bearing faces outside. 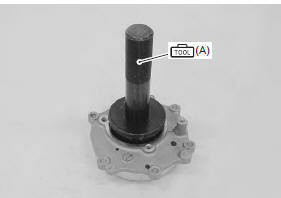 Install the gearshift shaft oil seal (3) with the special tool. Apply grease to the oil seal lip. 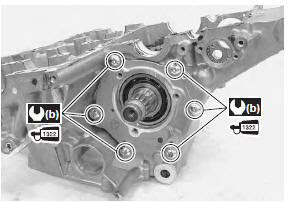 Install the gearshift cam bearing with the special tool. Put the driveshaft assembly (1) into the lower crankcase. 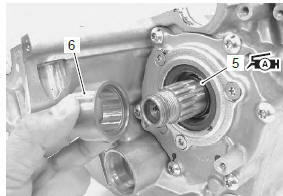 Install the driveshaft right bearing assembly (2). 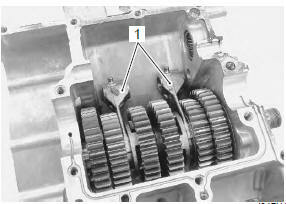 Apply thread lock to the bolts and tighten them to the specified torque. 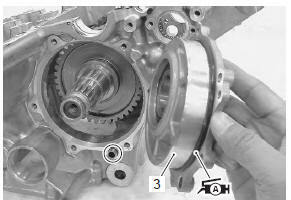 Apply grease to the o-ring and install the driveshaft left bearing case (3). 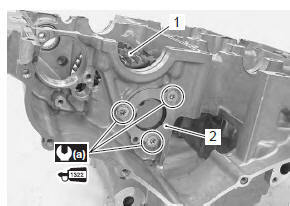 Apply grease to the oil seal lip and o-ring. 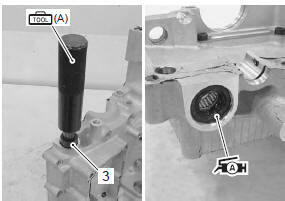 Install the oil seal retainer (4). Apply thread lock to the screws and tighten them to the specified torque. Apply grease to the o-ring (5) and install it to the driveshaft. 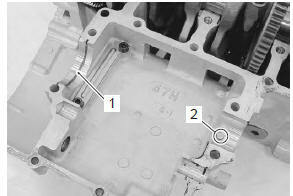 Install the gearshift forks (1) as shown. Install the gearshift cam (2) with the bearing fitted. 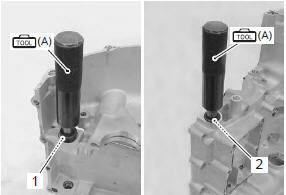 With engaging each fork end to the cam groove, insert the fork shaft (3). 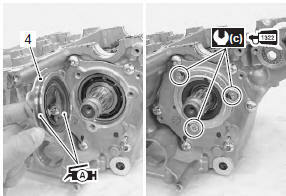 Install the c-ring (1) and bearing pin (2) to the upper crankcase. 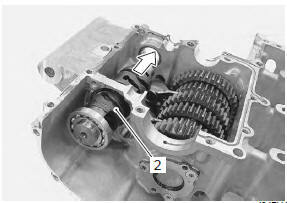 Install the countershaft assembly to the upper crankcase. align the c-ring with the groove of bearing and the bearing pin with the indent on the bearing. Turn the bearing and set the bearing dowel pin in position. Install the clutch push rod oil seal (3). 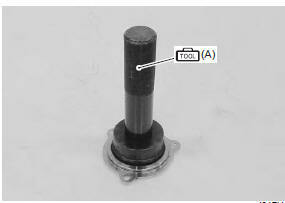 Install the gearshift fork/gearshift shaft (4) and gearshift shaft plug (5).